IEC 60051-9:2019 applies to direct acting indicating analogue electrical measuring instruments and their accessories and gives guidance for applicable test methods and for the performance of test equipment. 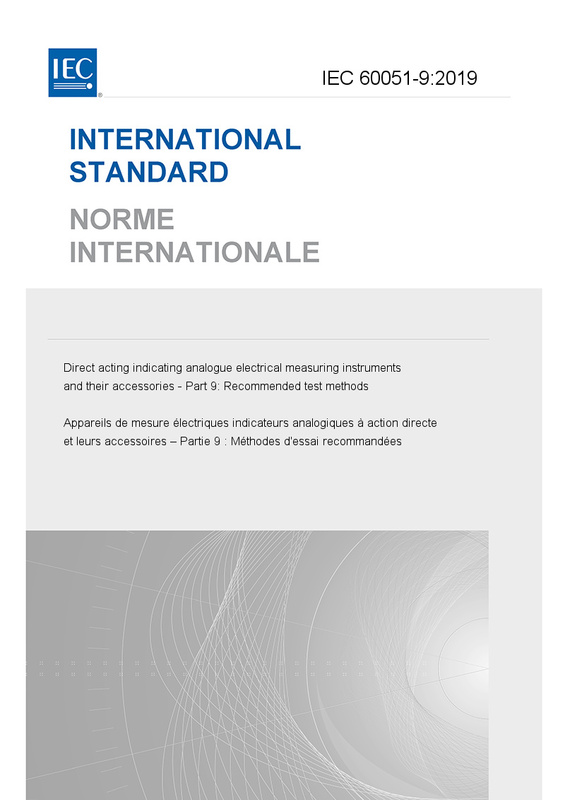 This document does not apply to: – special purpose instruments that are covered by their own IEC International Standards; – special purpose devices that are covered by their own IEC International Standards when they are used as accessories. IEC 60051-9:2018 cancels and replaces the fourth edition published in 1988, Amendment 1:1994 and Amendment 2:1995. This edition constitutes a technical revision. This edition includes the following significant technical changes with respect to the previous edition: a) adding performance requirements for test equipment; b) updating the references to the applicable standards for test methods.